Over the last few months I’ve mentioned JT65, or to be more precise, JT65A a lot and it’s fair to say that I’ve had a lot of QSOs using it. In fact, at the moment it’s probably my favourite mode of operation. I explained about how a contact is made using JT65 in this blog post back in February so I’m not going to cover that again here. What I like about JT65 is the fact that one can work good DX using simple aerials and low power and what better way to demonstrate that than by the following map. 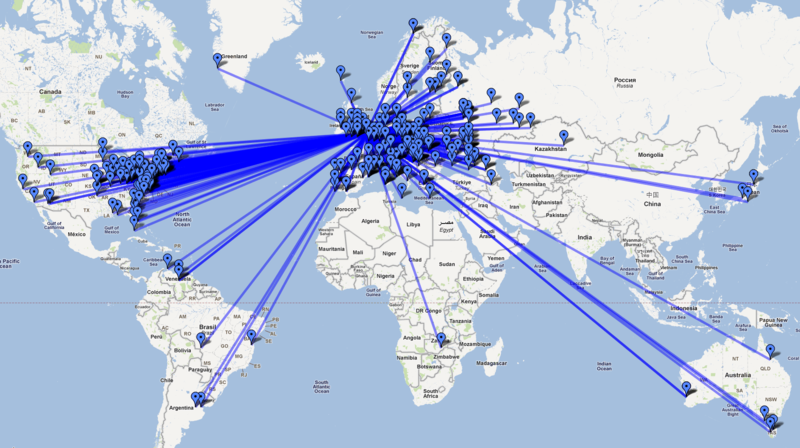 As you see from the caption, that’s a map of all QSOs I’ve had since the end of February 2011 using JT65. It should be noted that every single contact I’ve made with JT65 has been using just 20 watts or less and the vast majority of them were made before I put up my 40m delta loop so they’d have been made using a relatively inefficient random wire just 18ft above the ground. I do appreciate that data modes aren’t for everyone and JT65 is pretty rigid in the QSO format so it’s not one for casual chatting but I really like it. It’s very similar to the Weak Signal Propagation Reporter Network in that very weak signals are transmitted around the globe but it has one major difference – Actual QSOs are worked in real time with live exchanges of information (callsign, signal report and locator). If the thought of working the world with low power and a small aerial appeals to you then you should look at the following resources. The download of the JT65-HF software includes very good documentation regarding operating the mode, it’s possibly the best step-by-step guide I’ve seen for setting up datacomms software. JT65 looks very complicated but by following the guide you will become proficient at operating very quickly. It will also go into detail of how the mode works if you want to get technical about it but you don’t need to go that far if you don’t want to. I’m always on the lookout to work new people using JT65A so if you fancy a sked, please contact me either through the comments page on this entry or by emailing me via the link on the “What is QSO365?” page. This entry was posted in Amateur radio, HF, JT65, WSPR and tagged HF, JT65, JT65-HF, JT65A, QRP, QSO365. Bookmark the permalink.